Suzana Stojanović’s pictorial obsession is galloping horses and the universe. She is a versatile artist and a composer, and she also studies astronomy. Her paintings are parts of private collections in Serbia, America, Italy, Switzerland, Denmark, Croatia, Former Yugoslav Republic of Macedonia, Montenegro and Slovenia. She paints horses and makes an in-depth study of their anatomy, she writes short stories and prepares a book called “Following Old Masters”, where she gives a detailed description of her long-term experiences and experiments, different techniques, making sketches and paintings. Where does your artistic obsession with horses stem from? - You do not choose your subject topic, it chooses you. With their beauty, intelligence and grace, horses chose me to paint them and enter their world. Horses are romantic, fluttering and fabulous. While I am painting them, I feel like I am diving towards the bottom of the sea, and when I finish every part of their slinky body, it is like I am collecting the precious stones from the bottom of the sea. The most difficult part is to paint the ambience because it has to be their background; to stress their every movement, to understand their message. The greatest mystery is to grab the unattainable, to grab something that cannot be gained just by using a good technique, but by something that we carry in ourselves and that can only be seen by us. Will your first animated movie be dedicated to horses and their anatomy? - A horse is a mystery for me, just like man is. We still do not know it enough, and we understand it even less. Maybe my future works will reveal more of what is hidden in that unusual creature. My first animated movie will be based on one of my mysterious stories. Does your art change the world, the individuals or you? - I work with the finest and loneliest part of the soul. I try to see with my heart. The meaning of my painting is to give people new worlds, to weave the light sky for them and perhaps to warn them sometimes. Who has your paintings in Montenegro? Have you had an exhibition in Budva? - The names of people who have my paintings and drawings as part of their private collection will be a secret. Even secrets make life richer, don’t they? I have not had an exhibition in Budva, but I would love to. What do you think about Montenegro artists and Montenegro mentality? Are they close to you? - Montenegrins are people who help people in trouble. I still believe that “manhood and bravery” is important for them. Are you afraid of being old? - Instead of answering, here is one thought of Leon Blum: “A citizen is a pig that wants to die of old age”. The only thing I don’t really marvel, and that I accept as inevitable is death. That is why I create, in order to overshadow the idea of it. Do you believe in love that saves the world from collapsing? - I do believe in love, but nowadays it seems to be an instant product. Everlasting love can only be found in Cinderella and Sleeping Beauty. Such love can move mountains, as well as save the world from the evil created by people. Love is also called God and this is why it can do everything. - Childhood is the most beautiful dream. Dreams and dreams come after that, dreams that take us between stars and rocks and lead us through life. I often dwell in my dreams but I never forget to come back from them. The piano, literature, painting, astronomy... Where do you usually find yourself? - There are so many skies I can land. I don’t want each of them to slip away from me, because that is the only way that makes me complete. Halldor Laxness said once that the one who searches only for the goal cannot see the beauty of what he does. Music, as well as a painting or even a good book tell stories that the whole world understands. That is why I love all these arts and I am going to work on them. 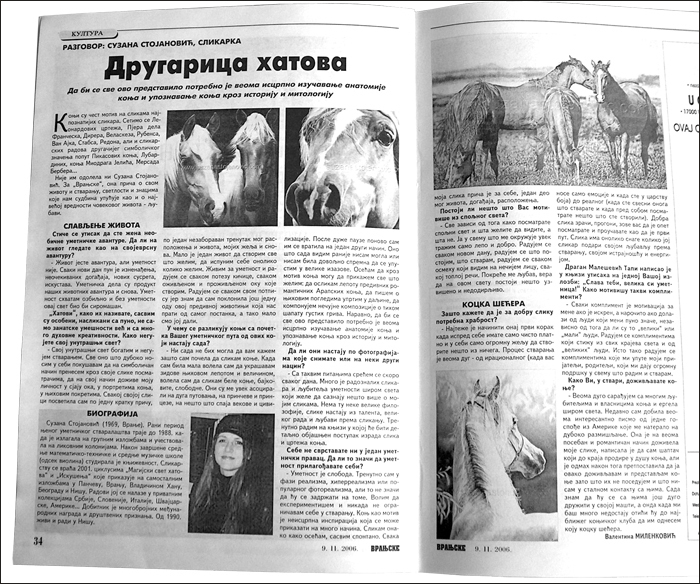 To introduce all this it is necessary to have complete study of horse anatomy and also horses recognition through history and mythology. Horses are frequent motive in the paintings of worldwide known artists. Let us just recall the works of Leonardo Da Vinci drawings, Pier Francesco, Albrecht Durer, Diego Velazquez, Peter Paul Rubens, Jan van Eyck, George Stubbs, Odilon Redon, but also the paintings of other symbolical meanings like the horses of Pablo Picasso, Lubarda, Miodrag Jelić, Mersad Berber... Suzana Stojanović also could not resist them. For “Vranjske” newspaper she speaks about her life and creating, lights and signs that destiny sends to us. She speaks of love, the greatest value of human life. The impression is that you are a woman of unusual artistic adventure? - Life is an adventure, but art is not. Every new day is full of surprises, unexpected events, new meetings, experiences. The works of art are the products of our life adventures and dreams. Art is something that I take seriously and without art this world would be poor. Horses are completely unique, painted with lot, not only skillfulness, but also spiritual creativity. How do you cherish your inner world? - I cherish my inner world and make it richer with creation. Everything that I carry deep in myself I try to transfer symbolically through my paintings to the observers, so that they could experience my personality in eye sparkle in the portraits of horses, in their moves. I have dedicated to each of my paintings one of my short stories, one of my unforgettable moments of my mood and life, my desires and dreams. One life is short for creating everything I want, for fulfilling myself in the measure I want. I live for art and I feel happy for every single move of my brush, every living eye I create. I rejoice to each my signature, because I know that I have gifted one more ode to this magnificent animal that has been following us from the very beginning, and we have been giving so little to them. What is the difference between the horses from the very beginning of yours artistic work and these that appear nowadays? - I still cannot tell you now why I have started to paint horses. When I was little I loved to decorate the walls with their beauty and their greatness. I loved to paint white horses, fairy tales horses, free ones. They have always associated me to long trips, to princes, princesses, to something that connects centuries and civilizations. I returned to them in some other way after a long break. The thing that I see today is something that I could not see before or I was not ready enough to let myself go into these great temptations. I feel that through this horse motive I can express everything that I want: to paint beauty of these magnificent and romantic Arabian horses, to write about their eye looks deep into the distant places, to compose silent melodies about the mute whisper of their thick manes. Of course, in order to introduce all these, it is necessary to study horse anatomy and to have knowledge of horse’s roles through history and mythology. Do they appear after the photos that you take or in some other way? - I meet this kind of questions almost every day. There are many curious painters and art lovers worldwide and they all want to know something more about my paintings. There is no great philosophy, paintings appear from talent, great work and love towards the creation. At the moment I am working on a book where the procedure of horse paintings and drawings will be in details explained. You do not classify yourself into any artistic movement. Does that mean that art is something that you adjust to yourself? - Art is freedom. At this moment I am in the phase of realism, hyperrealism or popular photorealism, but it does not mean that I will keep up to it. I like to experiment and never limit myself in the creation. Horse as a motive is limitless inspiration that can be shown in many ways. I paint in the way I feel, totally spontaneously. My every painting is a story for itself, one part of my life, an event and mood. Is there anything that motivates you from the outer world? - Everything depends on the way you regard the outer world and on the wish what do you want to see and you don’t want to see. I search for something nice and good in everything that surrounds me. I am happy for every new day, for the fact that I exist, I am happy for every smile that I see in someone’s face, for every warm word. Love moves me, faith that there is something supreme and untouchable in this world. Why do you say that one needs courage for a good painting? - The hardest part is to make the first step, when in front of you is just clean canvas and in yourself only a huge wish to create something out from nothing. The process of creation is very long: from the irrational (when only emotions carry you and when you’re in the realm of colors) in real terms (when you are aware of what you create and when you are watching in front of you something that you have created). Good painting shines, haunts, calls us to watch it again and study it as for the first time. Painting has that much strength as much an artist gifts it with his or her own love, energy and fortitude towards the creation. Dragan Malešević Tapi wrote in his Book of impressions during one of your exhibitions: “Glory to you, you are a great artist!” In what way these compliments motivate? - Every compliment is a motivation if it is an honest one, especially if it comes from the people that mean a lot to me, no matter if they are “great” or not. I am happy for compliments that come from all the parts of the world, also from those “great” people. However, I am also happy for the compliments given by my friends, parents, who give me enormous support in everything I do and create. How do you, in fact, experience horses? - I have been cooperating for a very long time with horse’s fans and lovers, but also with horse farms worldwide. Recently, I have received a very interesting letter from one lady from the United States that forced me into deep thinking. She has experienced my paintings in one very romantic and special way; she wrote that I was a whisperer who goes deeply into the horse soul till the end, but immediately after this she presumed that I lived and represented the horses in this way because I did not own them and since I was not in the contact with them. Now I know that I will spend long time with them in my imagination and at the moment I miss them terribly, I will go to the nearest horse club to bring them a sugar lump. A girl with downy flapped cap, that “must have” detail of the generation inherited from the pile of values, ideals and all together “heavenly chases” of her own parents and “close relatives”, appeared before time to the appointed meeting. She was sitting at the chair squirming as if she were at the dentist’s. She was speeding up the beginning of the conversation, which was a possible indicator that she would be a little pushed to speak, because it seemed that she had been one of those who liked “to push fast to the end”. Music that slowly overcame our hosts cozy autumn saloon, tucked up with the fragrances of early coming autumn, dimmed light of delicately placed lamps, as if it were that necessary associate to relax a young woman in the lack of time. However, she pulled her cap even more to her flaming eyes. Who is Suzana actually? It was a kind of beginning. - From the earliest days that I remember, I was doing only the things that I was feeling, not accepting to do anything I didn’t like. Painting is something that was making me complete, that I liked. It is my freedom. Since at the age of four I started drawing and very soon my first horse in natural size appeared on the wall of my room. It is still there, always waits for me when I visit my house in Vranje, beautiful, miraculous, the one, because it is alive all the time. Fifteen years later I stopped work. On the question: “why” she decisively responds “why is too personal question”. On the repeated question, she more willingly answers that she would never paint just for painting “it is completely spontaneous in my case”. I never know when I would paint. Simply I do not force myself , escaping from “personal”. Not before the insinuation that arts are before all possibly personal matter, Suzana Stojanović accepts. “I stopped instinctively, as I instinctively paint. The circumstances were like I felt that I “had to” stop and with that I protected somehow both painting and myself. I was suffering, but frankly my paintings were suffering too, deep down in myself, but when I returned thirteen years ago I think that it had to be like that somehow. It was a period of my maturing, a period of new perceptions. The things I see now, I could not see then, possibly I was not able to see them”. Was that creative silence, collecting and “storing on one safe place” perception? - I knew that “it” will happen one day again, that is why I kept silent, I collected, took care of that, although the return to painting could happen even after thirty years, or in any other unspecific period. However, I kept all palettes and a few unfinished works. The period of silence ceases after thirteen years and preserved passion of nineteen years old girl starts to pour out. You, as a young woman started “once again”. Did something specific happen then? - It is complex, and that sort of my silence is a new beginning. Both of them started from me, nothing from the outer world did motivate me. All was only in me. Love moves me, belief that in this world there is something more supreme, something “close personal”. I did not go into painting for money or fame; I paint because I like to do that. I cannot explain that, it is my world; I do not know at all how does the moment of going into painting and getting into that beautiful world looks like. Indeed, while I think when I do my drawing, I recall of that, but at the moment I have palette in my hands, everything stops and color occupies me and carries me away. Your works belong to modern, high realism or hyperrealism. There are big disputes and very much divided thoughts on these “movements”? - My thinking about any sort of realism, no matter which degree you give to it, is not going into details, for example, horse portrait or human portrait. It is important to represent real space, real creature-person and real part of a day. It is realism for me: all lights, shadows, reality in richness of endless lights play; it is always connected to my mood, moment when I see something in some way and how it all looks like “in my head”. While I paint I do not stick to some principles, I paint how I feel. Painting is freedom. People feel that. It is love, the artist’s soul. It is something more than painting itself; it is a “subject” of observation. If it is not “alive”, people can feel that, I do not know how myself, but one painting is more than a painting, it is life and freedom. Freedom, as a universal postulate of humanity, is one high and hard objective, frequently something that cannot be realized in many spheres of creation and life. How do you reach it? - Freedom is the courage to be what you are. To work and to do the things you truly desire to do, is very hard, but if you are ready to try, it might succeed. I do not put up with force, I work only the things I like, in which I believe and I do not have prototypes; I do not use only special palette paints, special preparations, special brushes (one of the colleagues with Academy once stopped and ecstatically said “original Van Dyke brown”, I asked him to show me that in the painting, and then I showed him the tube of our “home made” palette paint. He did not believe!). I buy material from many producers and it is not important to me whether they are highly ranked or not, since everything is in my fingers and my head. I buy preparations mostly in bookstores, sometimes I make them myself, but I do not make a fuss about it. It does not deal with any kind of philosophy, or paints, preparations but it deals with courage itself. For a good painting it is necessary to have something more than courage alone. It is condensed and unconscious; I am conscious when I start my painting and when I sign it, everything in-between is total power of the painting over me. The process of creation is completely irrational; sometimes I create work from a single drawing, sometimes only with fingers and colors, but I do not decide upon that consciously. - They intrude somehow themselves, not with their beauty, it is possibly the last that forced me to paint them, but with their looks in the eyes, carried for centuries, as if they were collected in their glance. They simply haunt me. In their first phase, as a little girl, I painted horses too, although rarely, I draw and paint people most of all, and now, I do only horses. I will wait for some time the moment when I will recognize in people the people again, if they awake in them. Horses are “their own”, nobody possesses them, and people are very wrong, because horses are one unceasing net of our existence. People are not consequent, free, courageous, while horses are all these things. I will soon get very my “own horse”, but no one will posses anyone in that situation. I am looking forward to its coming, our “talks” and sugar cubes with which we make them happy. It will come soon, but for now it is a secret, although it will be his name “Secret”.